Wherever I’ve been in the world, I’ve thrown myself wholeheartedly into the food and beverages of that place. Sometimes, my linguistic limitation has caused some close culinary shaves. In Germany, following a menu’s traditional section, I almost ordered a plate of lung. Only the quick acting waitress saved me from this taste disaster. Though, perhaps the clue was in the German word for lung: lunge. Food in Spain is a joy. I adore everything about it, even if they’re not adverse to a piece of offal too in the shape of tummy churning tripe. But, trust me, that’s a rare item. Firstly, the diminutive portion sizes allow me to order a variety of treats like a personalised buffet. Then there’s the mixture of flavours, the abundant use of garlic and smoked paprika, the vibrant colours of fresh produce. It’s my favourite cuisine in the world. I fantasise about berenjenas with miel or solomillo al whiskey or secreto. Half the time, there’s no literal translation for these titles. 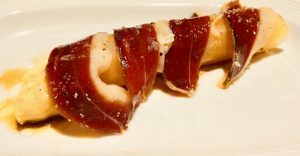 Take for example the Spanish dessert, Tocino de Cielo, a custard flan, which literally translated means bacon of the heart. Now I love my bacon but not as a dessert. I love tapas replicating. It’s like a little taste of Spain whenever I am. Likewise, I drool at the thought of paella when it’s made well. This is happy food. Every local bar will have a freshly made tortilla the size of an alien space ship. This is the other joy, even the smallest bar produces most of its own food without the arrival of pre prepared crap in a van. This makes every bar potentially a little different. Iberian ham. Asparagus. Fun food. The nearest thing to a Wetherspoons is a chain, 100 Montaditos, which still emphasises the small Spanish portion and is acceptable in a touristy way. It’s all bargain cheap there too. It even serves plates of fresh prawns for 6€. On one weekday there’s a two for one. A great deal for the budget Brit! Seafood: where do I start? My mouth salivates at the thought of plump gambas sizzling in garlic and paprika. How could I ever forget cod encased in charcoal or my contentment at smashing into my dinner to enjoy the succulent white fish? Paella with langostinos the size of small sharks, encased in an armour plated shell. However, their taste is well worth the struggle. It’s no wonder that Spain has an inordinate number of award winning restaurants. Even those without accolades produce dishes of gourmet quality as my ridiculous amount of social media sharing photos attest to. Add to this the wide array of drinks: delicious Spanish red wine. It’s easy to quaff a decent Ribera at 2€ or even a 3€ for a bottle of Rioja in the supermarket. Spirits served in copas. The immense vase that they’re served in certainly makes coping tougher. Although Spain might be hesitant when it comes to international cuisine, it can be found. Their Indians offer little more than mild, overly sweet sauces. Chinese food is often a throwback to the 1980s. Italians are somewhat more passable but heavy. However, some sushi is excellent given the fresh seafood. Most other foreign foods get no look in at all, unless it’s in Madrid. International fast food chains are present. However, their popularity isn’t as evident as elsewhere. Tourists, terrified of change, will venture in for a taste of bland mediocrity. Party goers find their munchies satisfied at 4am. However, even these weren’t enough to save the Seville city centre famous fried chicken joint. I smirked as the multi millionaire colonel had to surrender to Spain’s preference for quality food. Breakfasts Spanish style are not my favourite. A piece of crusty toast, smeared in olive oil and rubbed with a tomato isn’t as good as a freshly baked French croissant or as comforting as a full English. But I love the breakfast times. Served leisurely until midday, there’s no rush to grab a Mac something by 10.30am. Nor is it odd to have two breakfasts. Tapas can get frustrating. Sharing food often depends on the company. If you dine with a starving friend, you’re likely to face a tapas duel when forks clumsily clash as you attack the final albondigas. The rules of who eats what and when aren’t defined. Sometimes there’s an overwhelming desire just to have your own plate and your own food. However, usually it is a pleasure to share food. It is a really sociable way to feast. What I love is this sociability. And the meal times. This is really the only rule in Spain. Lunches, the larger meal, are around 3pm and often at home. This allows for a nice little nap afterwards. Never under rate the siesta. It’s the perfect accompaniment to food. Good dinner places serve tapas in a small time frame of 9pm to 11pm, with 10pm being people rammed. Reservations aren’t really a thing in Spain. Taking a chance for your food is. Eat earlier than 9pm and: 1) you are foreign, 2) you are ‘loco’, mad or 3) dangerous, as you are both. As with the sunshine, follow the habits of the locals. Follow them to the popular places too. They’re popular for a reason. Even with a queue, a 2€ glass of wine makes a wait easy to cope with. Spanish food is something that I long for on a daily basis. Yet another reason to relocate to Spain as soon as I can.